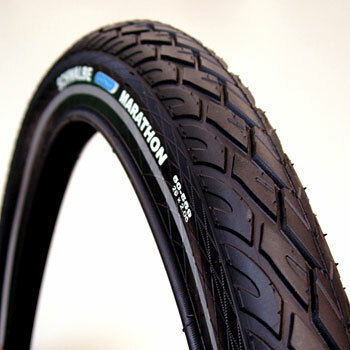 My original Geax StreetRunner slick tires were getting cracked after about 1500 km of use, so I took the opportunity to put Schwalbe Marathon tires on the bike. Very good tires that still feel fast despite being “treadier” than the Geaxes. I bet they will last longer, too, if reputation is any indication. 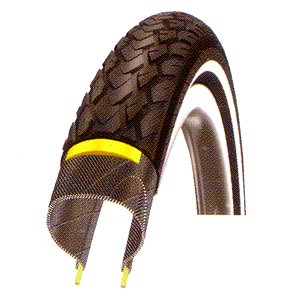 Schwalbe Marathons have kevlar inside, and have a protective strip and their Marathon Plus line is even heavier duty. I like the Marathons so far; they feel quite grippy in the corners.